Now, you may be thinking, “Fans? …What’s so interesting about fans?” Or you may not even be that fussed, just a tad curious. Whatever guys, fans are incredibly versatile. Hopefully this review will show a bit about how diverse the fan market is and what’s on offer for people. From extreme flow rates to the super quiet, people usually have different needs. 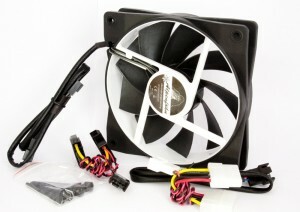 Of course the perfect fan would be one that has amazingly high airflow and creates zero noise. If only this were possible, but sadly with movement of air there has to be some sound. This said, fan manufacturers are getting quite clever about how they manipulate the air before, and after, it makes contact with the blades; all in pursuit of removing as much noise as possible. We have three differing designs to compare today. The “Golf” design on the Zaward Golf Fan G3 (ZG3-120TL), the “Wing Boost” on the Alpenfohn 120 WB Black & White , and “Focused Flow System” on the Noctua NF-F12. I tried to mount the F12’s using the rubber mounts on the top of my case but had real trouble getting them through. I also found the fan didn’t sit flush with the case, which is something that got on my nerves. I ended up mounting them using standard case fan screws. Now, maybe I was just doing it wrong, but it was a little disappointing I wasn’t able to mount them the way I wanted. Burnt sienna and cream are the two colors chosen for the NF-F12, I like to think of it as a malted milk ball that someone licked a little. The focused flow blades are quite striking, a big difference from the usual four pillars coming in from the surround. This fan has 11 of these focused flow blades, all with three small notches. The notches are to focus the airflow through the blades, optimizing performance. 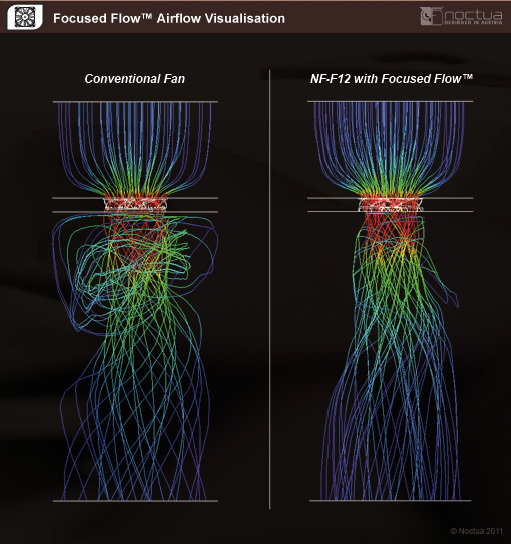 As you can clearly see from the diagram, the airflow has a much more directional exit when compared to the “conventional fan”. This improves static pressure, which means it should perform well with high resistance devices such as heatsinks and radiators. 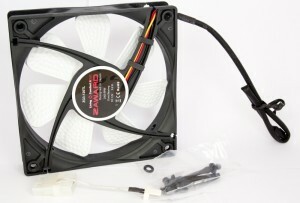 The Zaward Gold Fan G3 ZG3-120TL is a special fan made for Overclockers.co.uk (not to be confused with Overclockers.com). From a quick comparison of the specifications, it looks to be a rebranded ZG3-120D with white blades, instead of blue. The fan uses Zawards, “Hexagonal Dimple Blade” which features an aerodynamic lift effect to raise airflow and reduce noise. The power adapter is for those who want 12 V straight from the PSU, and thee rubber mounts are an alternative for attaching the fans if you find the usual screws vibrate too much. I have found with a few cases that certain fans can vibrate quite horribly, so testing these should be interesting. The packaging is nice and small for this fan too. I’m a fan (pun intended) of minimal packaging. While being better for the environment it’s also easier for storage and well, who really needs a massive box? It’s quite likely to be thrown away and not placed upon a mantle. The Alpenföhn Föhn120 Wing Boost Black & White Plus, according to Alpenfohm is “Equipped with injected decoupling elements, WB technology, and HD bearing, making this fan a solid base of your system”. The HD bearing is hydraulic, which is significantly quieter and has a longer life expectancy than a sleeve or ball bearing fan design. This fan has a similar white accent, which is again to my preference. This time it’s more subtle, with only the inside of the surround being white and the rest of the surround, along with the blades, being black. The surround is slightly rubberized which was very odd to feel as it came out of the packaging, but it should help decrease any vibrations. The 7 V and 5 V adapters are quite a good idea if you don’t want the bother of playing with BIOS settings and prefer a constant speed for the fan. a.) Decoupling elements: Thanks to injected decoupling elements in the frame of the fan the new Föhn120 WB offers a much quieter operation through the reduction of vibrations. b.) Soft-Frame: More vibrations can be avoided through a thin layer of rubber covering the frame of the fan. WB-Technology: Thanks to the optimized wing designs with WB-Technology (Wing Boost Technology) the fan operates absolutely quiet at full speed of 1500 rpm. The CPU will be run at both stock (3.5 GHz) and 4.5 GHz (@1.225 V) to test the fans under average and more extreme conditions. 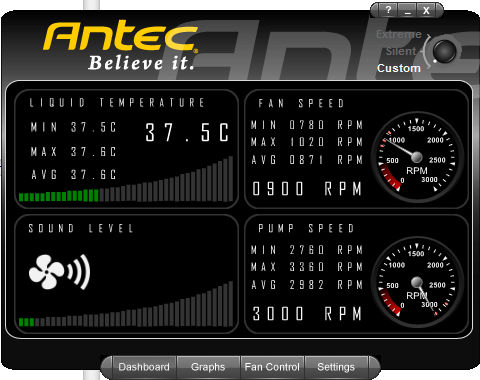 The fans will be set to “Silent” for 3.5 GHz and “Extreme” for 4.5 GHz using the Antec Chill Control V software. Prime 95 will be used to load all threads on the CPU and the temperature recorded using CPU temperature sensor from ASUS AI Suite II after 20 minutes. All temperatures will be recorded relative to ambient (which is measured using a K-Type thermal probe in the CD bay area of the case). There are no results for the G3 on Silent mode as the fan only has three pins, so speed control was not available through the Antec Chill Control software. The fan speeds were divided by 10 to allow the graph to be easier to read. 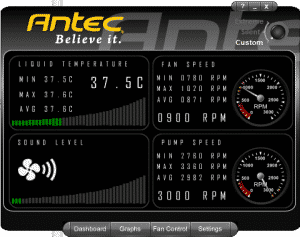 For example: The stock fan speed was ~800 RPM. We can see that the idle deltas are fairly similar (within 2 °C), and in the end don’t really matter as long as the CPU doesn’t get too warm, which it was nowhere near during the test period. The main figures we want to look at are the load temperatures. 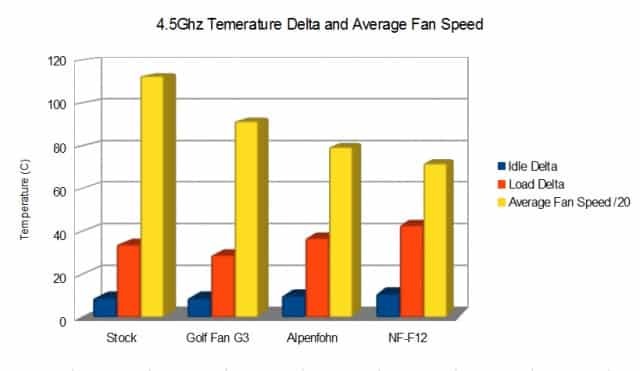 From this graph we can see the Alpenfohn beats the stock fans for efficiency in that is has a lower RPM, and lower noise, but the temperature is the same. 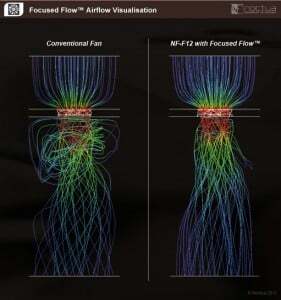 The NF-F12 has a significantly lower speed but a slightly higher temperature. At all times the temperatures were within a safe range. Considering this I’d say the NF-F12’s just edged this test, as they were incredibly quiet. I could barely hear them above my case fans; in fact I had to turn off my case fans to make sure the NF0-F12’s were still spinning. So, if you want a really quiet fan that can easily handle a CPU at stock speeds, then the NF-F12’s could be the ones for you. For this graph, the fan speed was divided by 20. This is the more extreme of the tests. The CPU was cranked to 4.5 GHz and Antec Chill Centre set to “Extreme mode”. The fans were running as fast as they can to achieve their maximum cooling ability. All beat the stock fans again, which was nice to see. The G3 managed to cool the most as it’s rated top speed is 2000 RPM although these samples only ran at ~1850 max, still well within their stated allowance. At maximum speed the G3’s were fairly noticeable on the noise front, but nothing that would bring anyone to their knees screaming for mercy like a Delta pushing ~250 CFM. More of a, “Oh, I can hear that fan now” kind of thing. 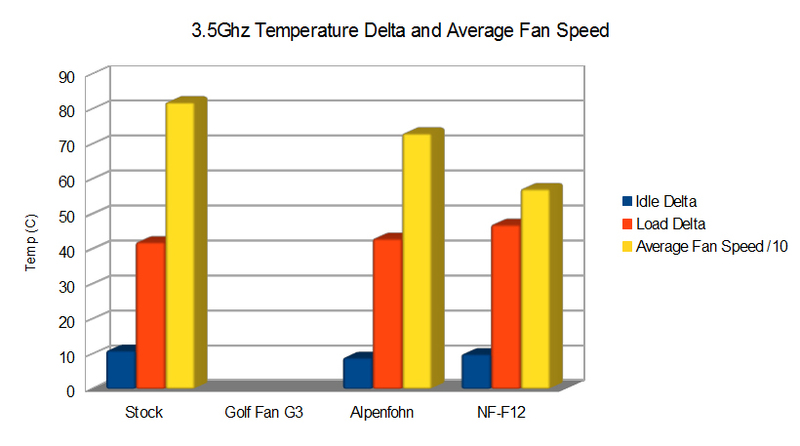 The Alpenfohn comes in with the second highest fan speed and temperature, with the NF-F12’s the slowest and warmest. The Alpenfohn’s were fairly quiet considering the load they were dealing with. I was impressed. The NF-F12’s didn’t quite run as fast as was needed for this test and the CPU got into my upper comfort boundary with one core getting to 80 °C. 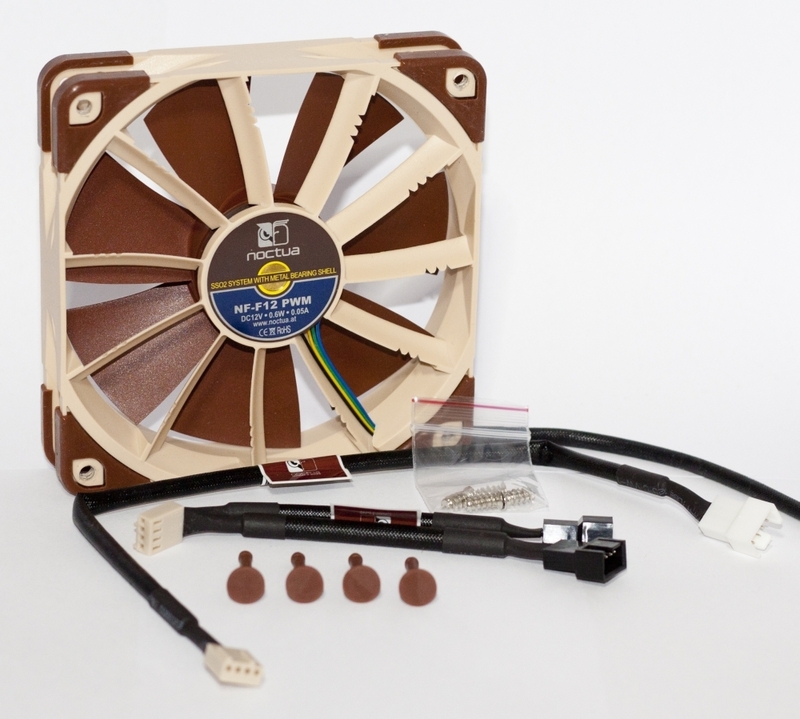 If you’re looking for the quietest fan of the three to run with your stock or lightly overclocked machine, then the Noctua NF-F12 fan is a great option. I can’t say I’m sold on the color scheme though, but you’re not going to forget it. It performed very well on the sound level front at low and high load, but due to the lower RPM, it struggled a little when the heat was really pushing. Perfect for a silent build. 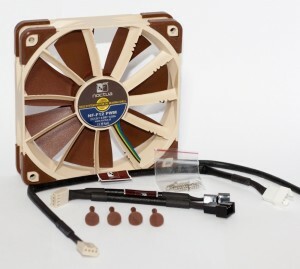 If you want a fan that can do quiet, but not quite silent, and also deal with big heat loads then the Alpenfohn is the best choice of these three. It’s also the best looking in my opinion. It managed to bridge the gap between airflow and sound levels. It has the ability to get the high RPM’s and airflow while also giving a quieter option when needed. If airflow is what you want and you’re not bothered by how loud it is, then the Zaward Golf Fan G3 ZG3-120TL is probably your best option of the three. The noise can be tamed via a fan controller or similar, but if you just want the raw 95 CFM all the time, it might be worth putting the box in another room. The fan noise could start to get irritating. These three fans turned out to be quite different in the end, with each having their own, equally useful performance areas.